Grandma and Grandpa Faiola came up to visit this weekend. We did our traditional early morning hike both days. 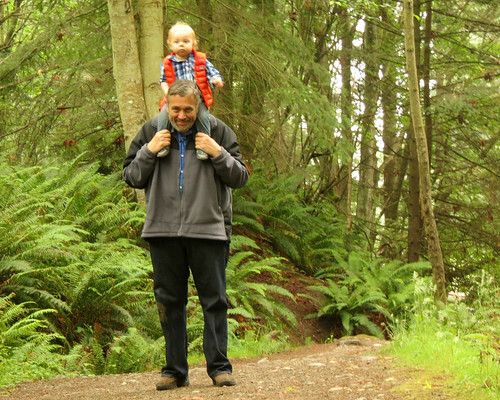 Grandpa really loved packing Jamisen for almost 2 miles up the trail. Grandpa proved to be quite a warrior, with nary a complaint over the 25-pound-weight on his shoulders. Proving he is all boy, he wanted to go straight into the water. Jamisen tried to share some of his newfound treasures with me (sand dollar encrusted with seaweed). It was slimy and gross. 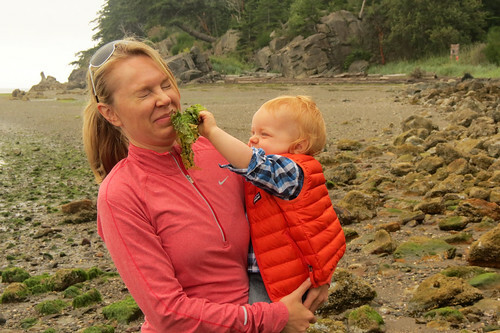 I’ll do a lot for my son but pretending to eat that harvested sea cuisine is not one of them. 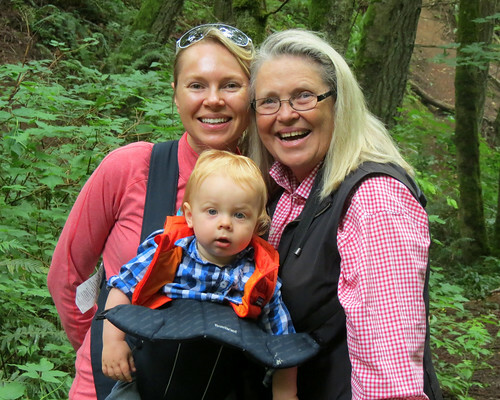 Grandma continues to be charmed by Mr. Jamisen and for the record, preferred Grandpa’s neck instead of the Baby Bjorn ride. 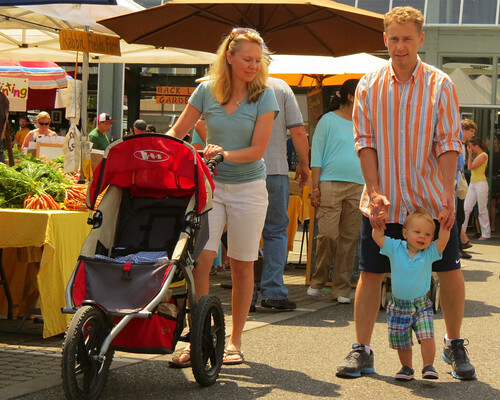 When Grandma and Grandpa visit, we’ve developed a routine for Saturdays that involves a trip to Farmer’s Market. I love this photo because of how oddly we all match. Also, are Jamisen’s shorts not the cutest ever? He looks like he’s ready to go golfing! You can’t tell but he’s got baby-sized Crocs on. I hope you had a great weekend – and that you’re looking forward to a productive week, working on your businesses and setting the state for an awesome Fall selling season. My sister has a little one and noticed one day that she and him were coordinating outfits often. 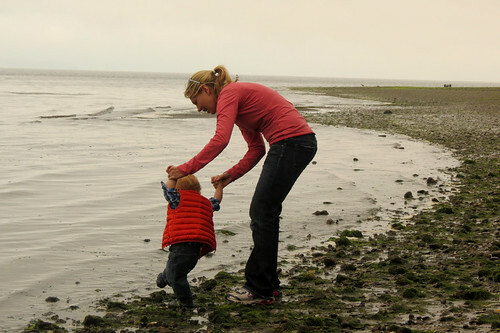 When she started looking around and observing other moms and kids, it was the same way! It must be a subliminal thing! Oh how sweet what a nice weekend! Jamisen looks like a little kewpie doll sitting on his grandpa’s shoulders! What a beautiful Family! You all look great in that color! So glad you take time out with family, with all you do for us recipe-challenged individuals! Beautiful photos. I love that family picture at the farmer’s market. We didn’t have that much luck with the weather in Germany. Cold wind and heavy rain destroyed all our plans to visit open air festivals and celebrations, so we had a very productive week end working to 11:00 PM last night. 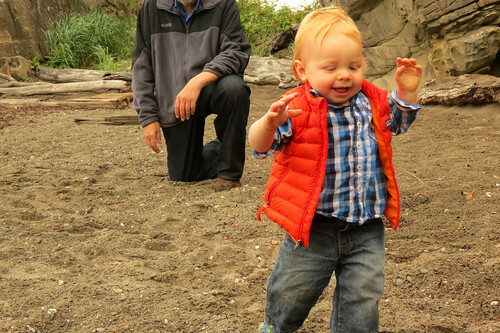 I’m crazy after that turquoise shirt of your son.